In Railway Empire there are 41 engines, 10 engines per era (1830, 1850, 1870, 1890 and 1910), with the last two of an era always representing the first two of the next era, plus one special engine: the EMD E-Series (diesel locomotive). 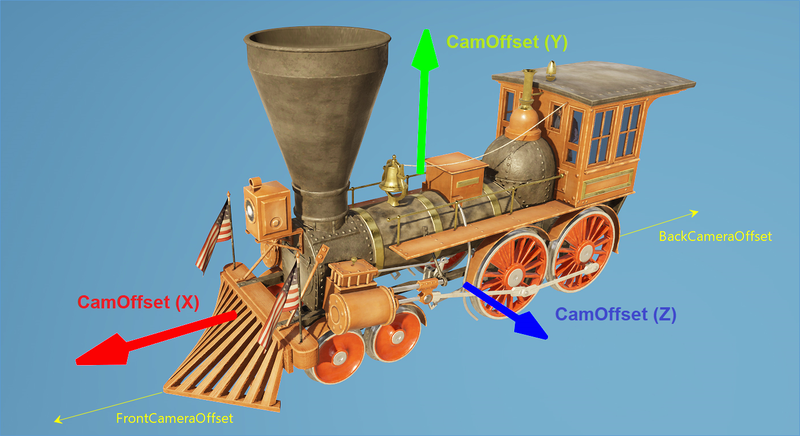 In general, an engine is a rather complex object, which has a model (engine and tender), sounds, icons and several camera settings for the ride-along feature, plus several values regarding speed, mass and general game data. In Tome, you can find those engines under Vehicle/Locomotive. Each engine has to have a technology which can be unlocked by research. Caution: Each engine cannot exist without a corresponding technology. 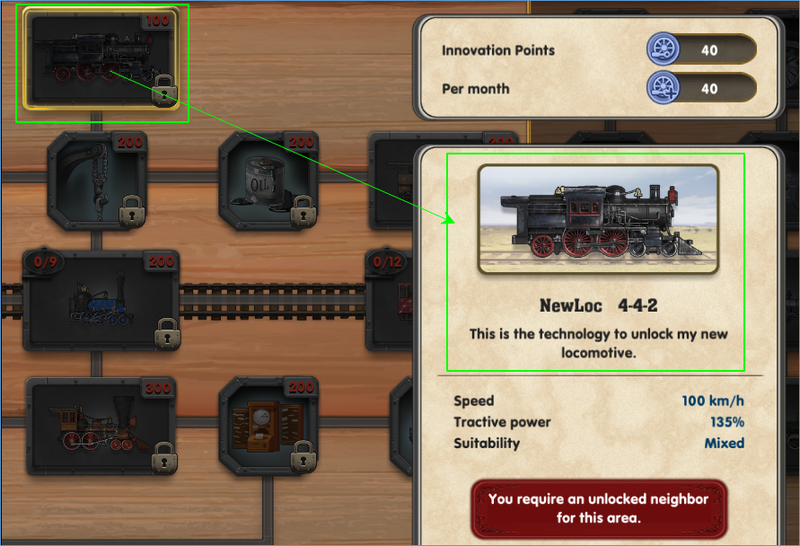 You will find the engines in the „Trains and Locomotives“ tech tree, just like any other regular research, but will be handled differently in Tome. You can find the engine technologies under Technology/Trains & Locomotives/LOC. You can learn on how to create a new technology under Technologies. In order to create a new engine it is recommended to duplicate an existing record. 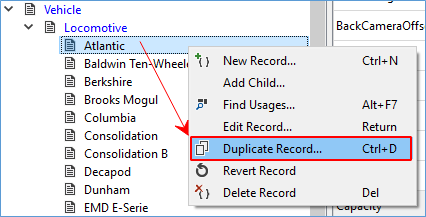 This can be achieved by right clicking an existing record and select Duplicate Record… with a left click. After renaming and conforming a new entry should be added to the list. The name of any entry is independent from its engine. The actual name shown in-game is defined with an entry called Name – for changing it, double click the Name-Field. It will open a table with a language Key on the left and an entry (Value) that needs your input. Enter your custom text next to your corresponding language Key (e.g. en for English and de for German and so on). Caution: You have to delete the ID from NameId in order to apply your custom input into the game. This is true for all strings you are about to change in Tome. If you want to change the Description of an engine, you have to delete the DescriptionId to make your custom input to show up in-game. 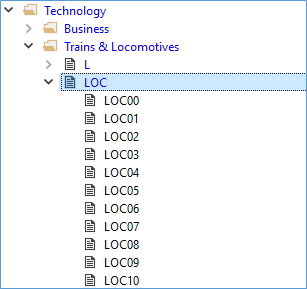 As soon as you have deleted the NameId and/or the DescriptionId and your custom text is entered next to your corresponding language Key your new locomotive should bear your name and/or description and should be in-game. There are several settings for the ride-along view. As this could be a little confusing, here is an image for a better overview. Sadly, you cannot import your own models into the game. 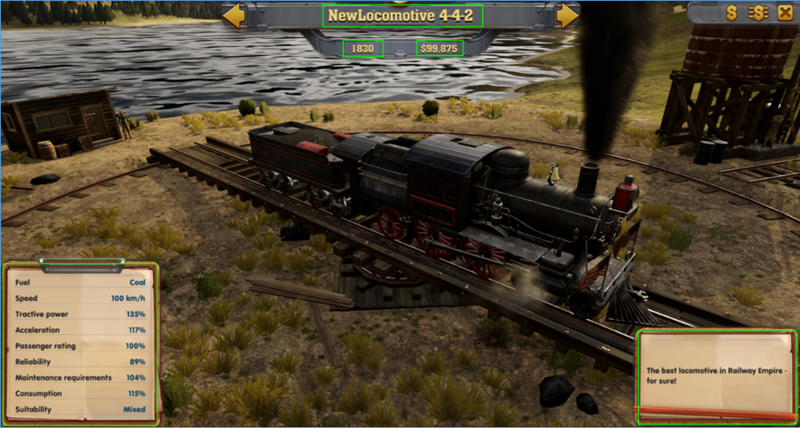 However, you are able to assign another engine (Asset) and/or tender (TenderAsset) to your locomotive. 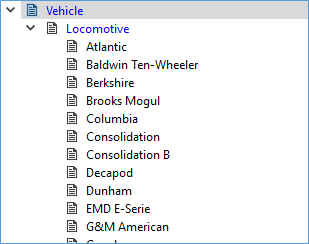 A complete list of all available models can be found here: Archive (RailwayEmpire_Assetlist). Unfortunately the same goes for the Icon, but you are able to assign any of the many existing icons from our Railway Empire list. This list of icons can be found here: Archive (RailwayEmpire_Iconlist). We are sorry to say that it is not possible to import your own sounds (SoundName, WhistleSoundName) into the game, either. Anyway, you are able to choose any sounds from those already implemented. A full list of those can be found here: Archive (RailwayEmpire_Soundslist).